People are always asking me where my favourite place in the world is and recently I’ve started to say Spain. It may seem like an unusual choice for someone who has travelled all over, but you really can’t beat the Iberian Peninsula. 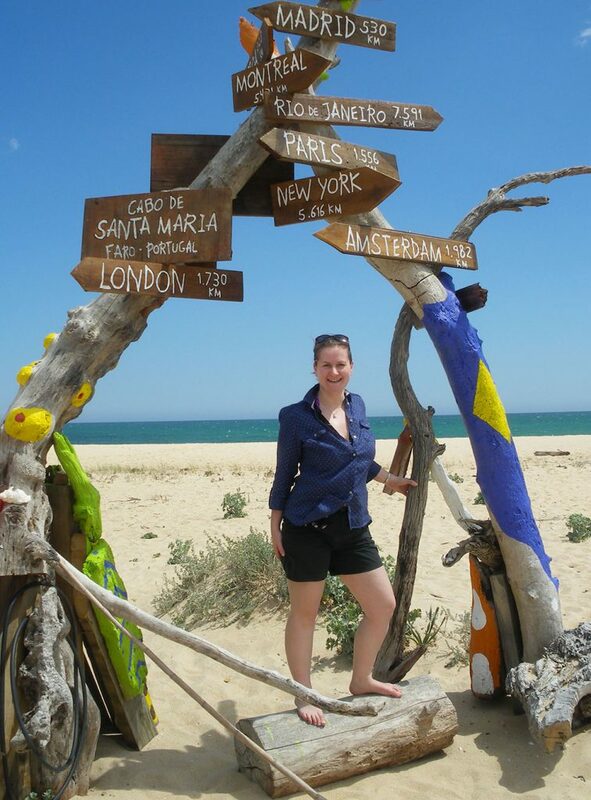 One of the great things about Spain is how diverse its destinations are. A trip to Andalucia will be totally different to visiting San Sebastian and you can enjoy historic buildings, hiking in the mountains or a foodie experience to rival anywhere else on the planet. Spain’s cities are among its biggest draws, but the mistake that many people make when booking their city break in Spain is thinking that it’s a choice between two destinations – Madrid and Barcelona – and that simply isn’t the case. There are so many fantastic, bustling towns and cities to explore in Spain and I will you all to step away from the well-worn tourist route and explore some of its other gems. 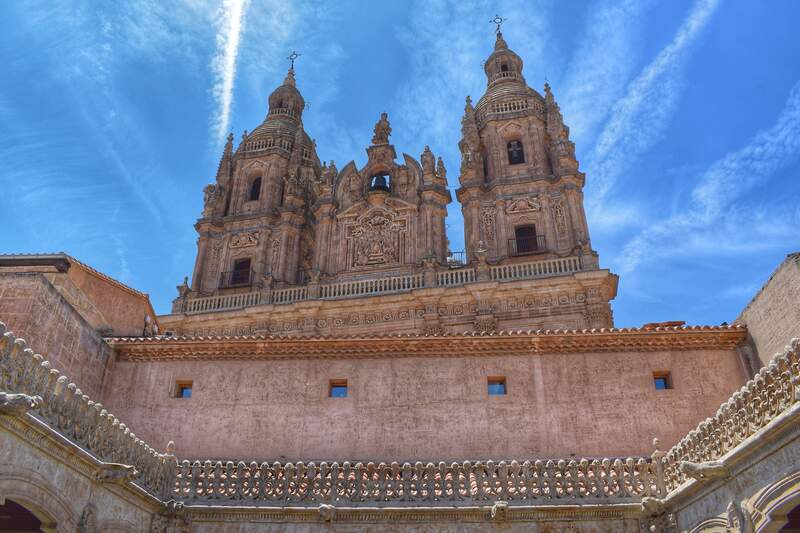 One such wonder is Salamanca, which has long been popular with British students on Erasmus programmes, but is relatively unexplored by the average tourist. 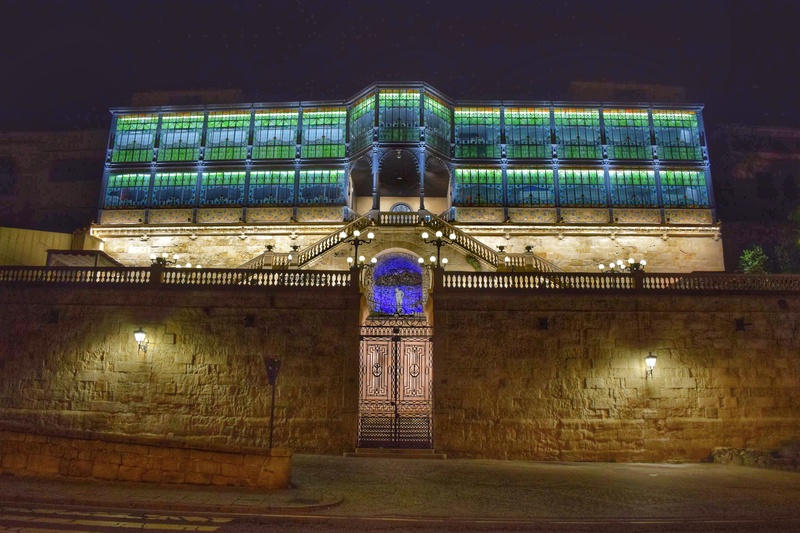 Salamanca is historic and full of culture, not to mention being relatively easy to get to. Many regional airports in the UK have regular flights to Madrid Barajas and from there the bus to Salamanca takes just two and a half hours. It departs from terminals one and two, so could not be much more convenient. When I went back to Barcelona recently after a gap of several years, I found that sightseeing in the city was a much more regimented affair. No longer can you rock up at the Sagrada Familia or Park Guell, buy a ticket and head inside; these days you are allocated a time slot and must entertain yourself in the meantime. In Salamanca, you can wander at your own leisure, popping into attractions as and when you come across them. An intriguing open door can lead to the discovery of a hidden gem and a stroll around the streets is an experience in itself. What’s more, as soon as you step away from the cathedral, you will often find that you have these wonderful historic places to yourself. As someone who has picked her knowledge of the Spanish language up in various parts of Spain and Latin America, with very little formal training, I’m always in need of speaking practice. It’s therefore a bit frustrating when you go to check into your hotel or order at a restaurant to be greeted in English. 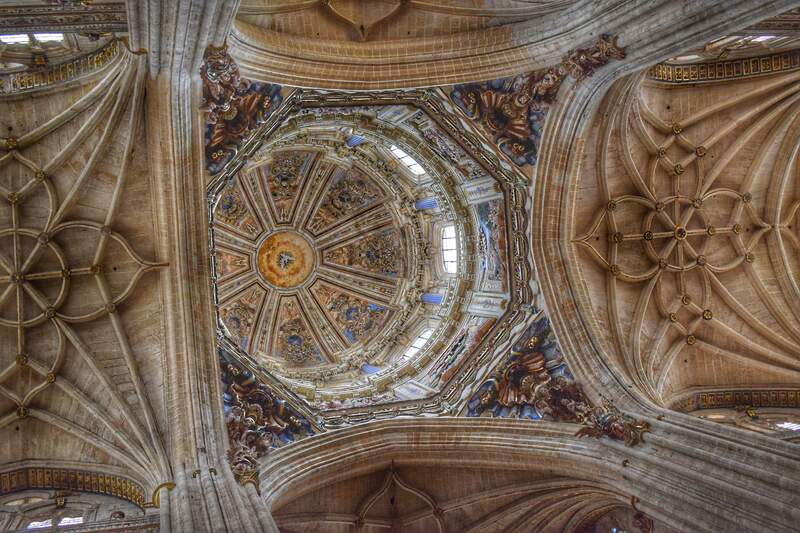 In Salamanca, it was only at the cathedral that I was addressed in English; the rest of the time I spoke Spanish and had the opportunity to get my ear back in tune. In fact, the people of Salamanca were so friendly that conversations went beyond the usual service dialogue, to chatting about the history of the Plus Ultra bar with its owner and my left-handedness with some patrons on Calle Van Dyck. Like many Spanish cities, Salamanca’s main square is its beating heart. The baroque facades of the Town Hall and apartments, with restaurants and shops on the ground floor, tower over the outside tables and daily life going on inside the Plaza Mayor. It’s a place that buzzes with life and somewhere you’re unlikely to miss on your visit to Salamanca, as many important streets lead off from the square. All the way around the Plaza Mayor are large medallions decorated in relief with some of Spain’s most famous faces. There’s Miguel de Cervantes and Christopher Columbus, as well as various Spanish kings and queens. Franco’s face was once among them, but was regularly graffitied, before it was removed in 2017. While in Plaza Mayor, make sure you visit La Novelty – an ice cream shop that dates back to 1905 – and prides itself on its unique flavours. I can personally recommend the cream cheese and mango combination, which was a delicious mix of rich creaminess and a fruity coulis to cut through it. 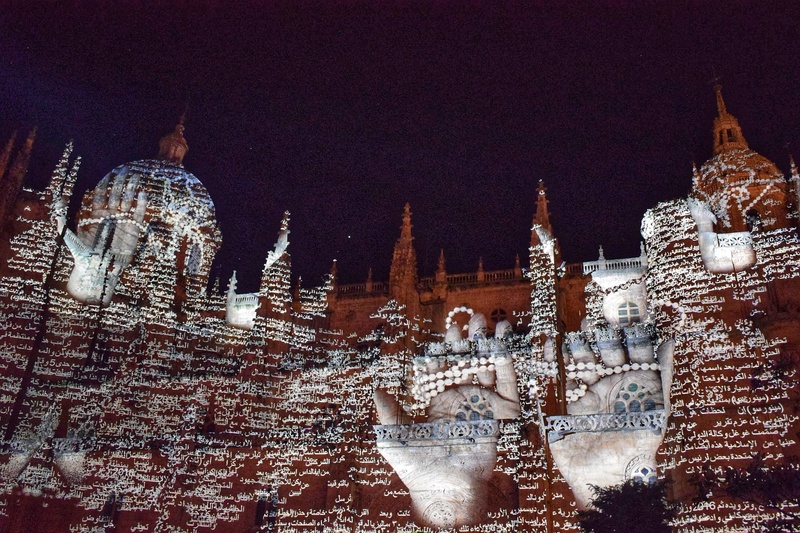 On my last evening in Salamanca in mid-June it was the annual Festival of Light and Avant-garde Arts. 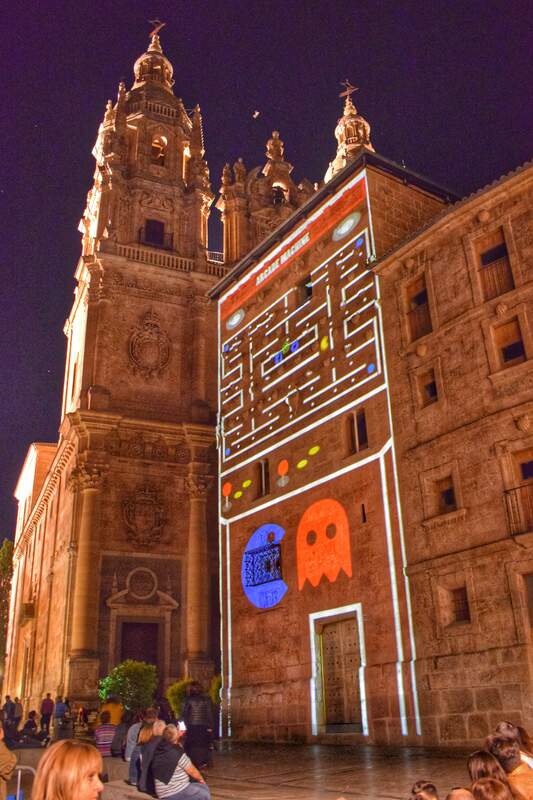 Among the places to host the incredible installations was the Plaza Mayor, with the Town Hall building illuminated with all sorts of projected images set to music. 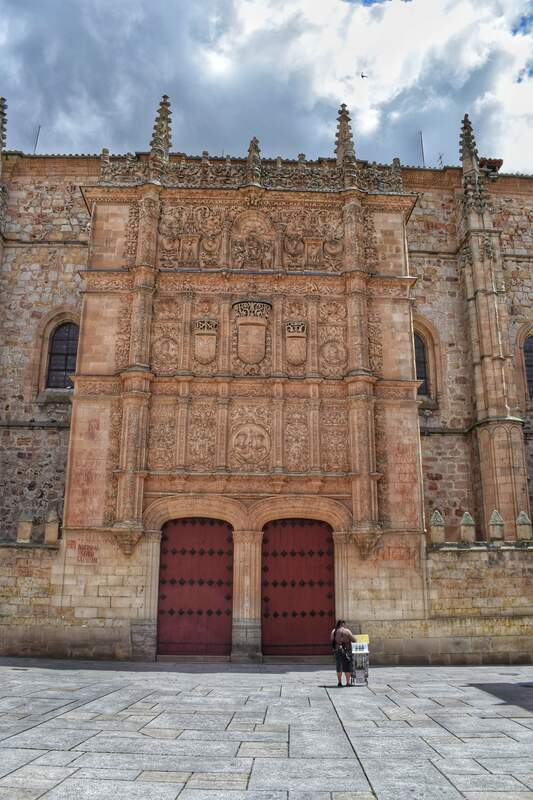 Salamanca boasts two cathedrals – the old and the new – both standing on the same site. Like many such churches you can climb up the towers, but unlike many others, you can actually explore a series of pathways across the rooftops, offering unparalleled views of the surrounding area and going inside at gallery level too. 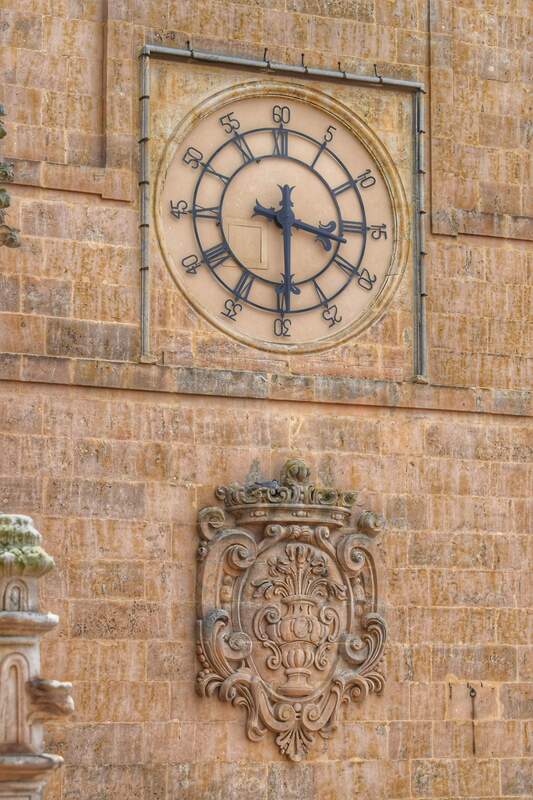 It was fascinating to be able to get up close to so many of the building’s features, such as a clock, gargoyles and crenellations. An innovative system means that there is no squeezing past fellow visitors on the stairs as you climb up the various towers. Screens emblazoned with a traffic light system show you when it’s your time to ascend or descend, giving a very generous 300 seconds to traffic in either direction. 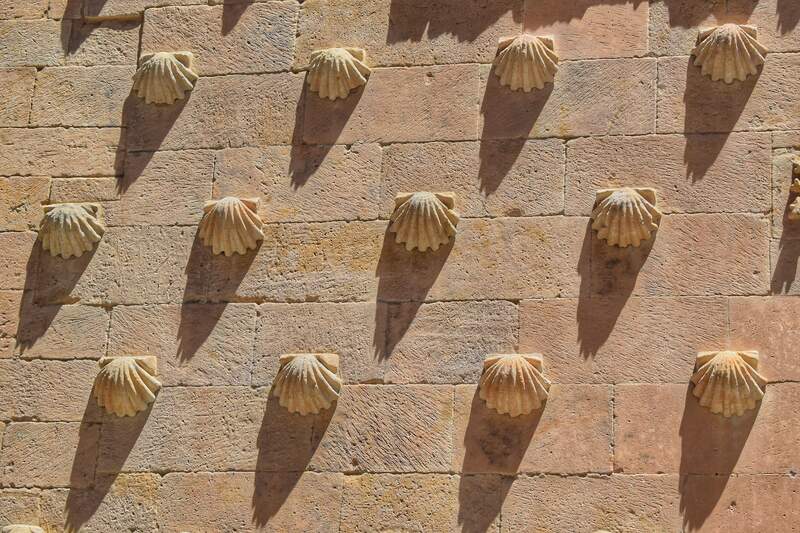 It’s hard to miss the Casa de las Conchas, as the 300 beautifully rendered scallop shells that decorate its exterior mark it out from all other buildings in Salamanca. Of course, the shell is the symbol that pilgrims carry with them to Santiago de Compostela and the original occupier was one Dr Rodrigo Maldonado de Talavera, who was of the Order of Santiago. Inside, there is a pretty courtyard and if you stand on the second floor you get a splendid view of the towers of the church next door reaching up in to the perfect Spanish sky. 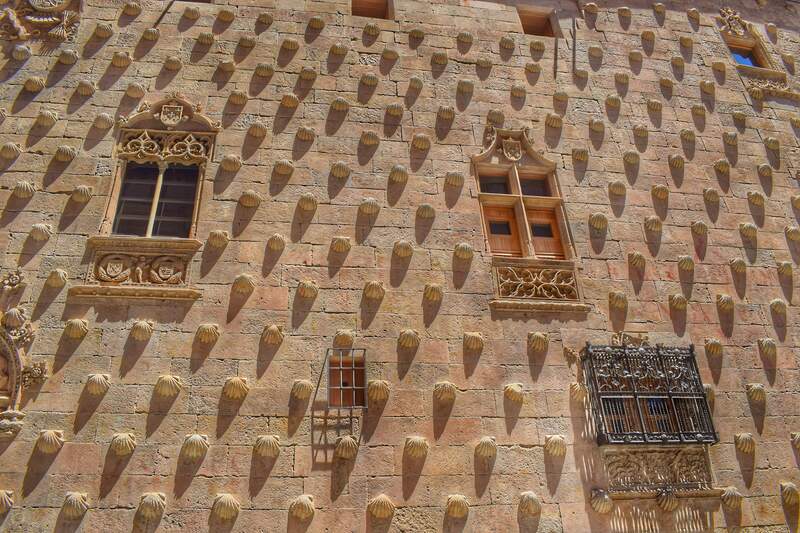 Casa de las Conchas also houses a library that is open to the public, adding to its charm. 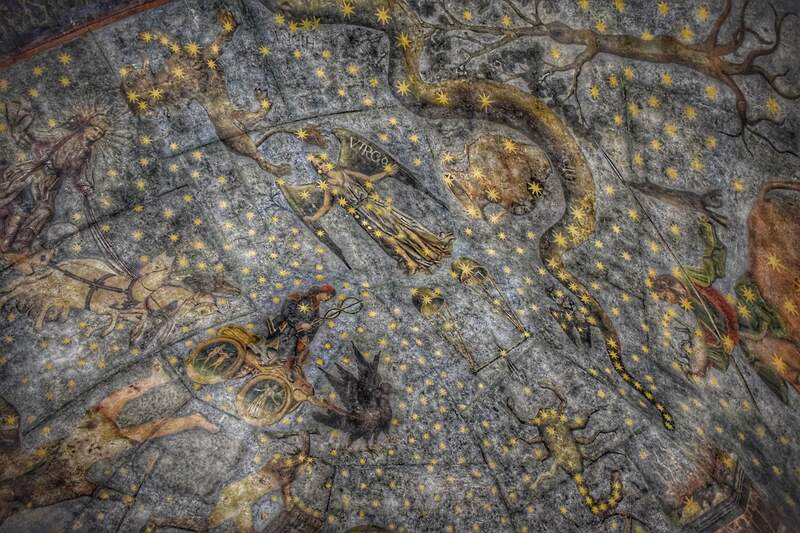 Stepping inside the building at the Patio de las Escuelas Menores and seeing the Cielo de Salamanca – an incredible fresco of the sky – is extraordinary, even if you know it’s there. It must have been the most unexpected discovery when it was revealed during restoration work in the 20th century. 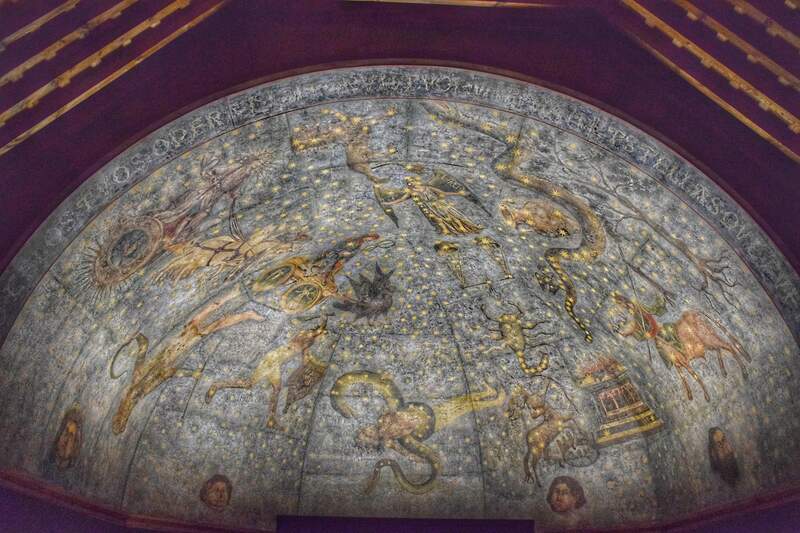 This masterpiece was painted on the inside of a dome in the 15th century and depicts the whole sky as it was known at the time – from Mercury in his chariot to Virgo with her wings outstretched. The constellations are then picked out in shining gold paint in many-pointed stars. It takes a little while to become accustomed to the dark, but as your eyes slowly adjust to the lack of light it starts to shine through. It’s worth spending a while here gazing up at the ceiling and taking in all the details. If like me, you get to spend some time with the fresco on your own, it’s even more special. 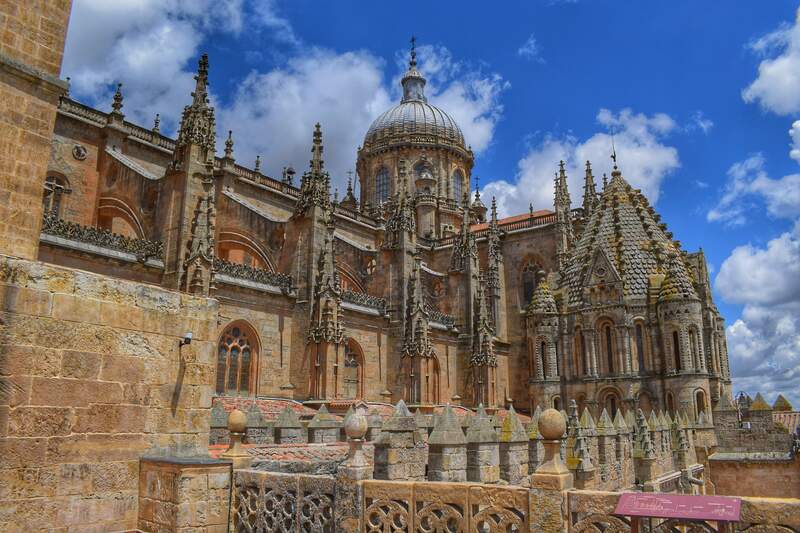 This ability to find yourself alone in these stunning locations is part of the charm of Salamanca. There’s no queue, no jostling for space and nothing to disrupt the calm. 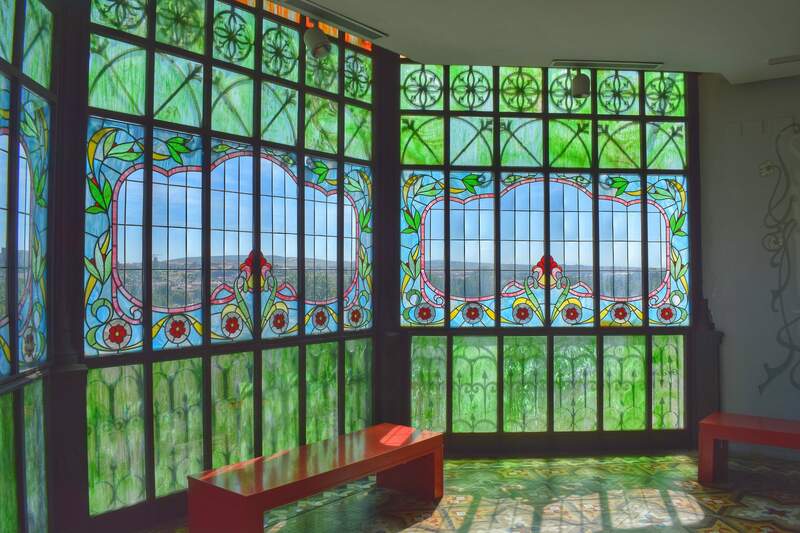 Salamanca’s Museo Art Nouveau y Art Deco is housed within Casa Lis and sets itself apart from the glowing sandstone of the rest of the city. 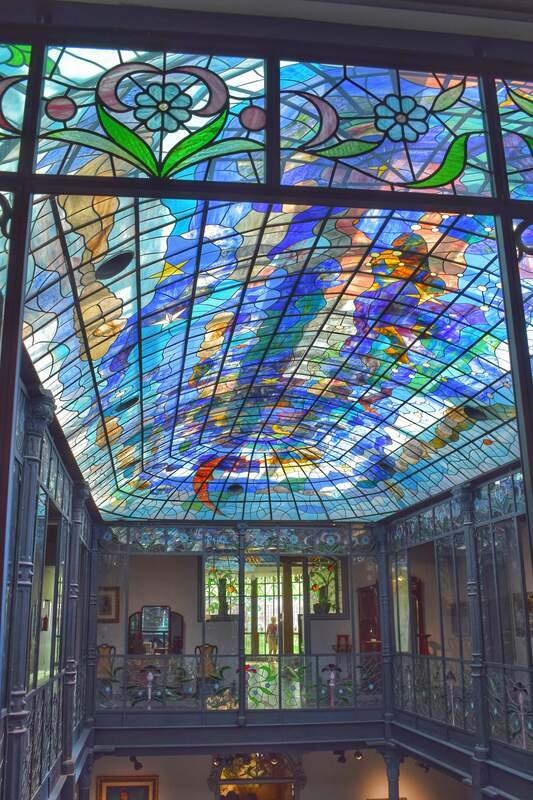 This stunning palace is a fine example of art nouveau style and has a remarkable stained glass ceiling, which is only outdone by the facade that faces the riverbank, as this has also been rendered out of the most exquisite coloured glass, mainly dominated by green. Charmingly, the museum’s cafe runs along the rear of the building, with this display as its backdrop. A vintage copper coffee machine adds to the scene and quite frankly, I found myself not wanting to leave. Trays of churros had been set out for a school party on the small round tables and when the children arrived, their cups were filled with thick hot chocolate and their chatter brought the room to life. While some of the exhibitions were interesting and beautiful – the collection of dolls upstairs was a little creepy – it’s the building itself that was the main draw for me. Do not miss the opportunity to see it all lit up from the outside, as it simply shines. No visit to Salamanca is complete without a visit to its most famous residents. 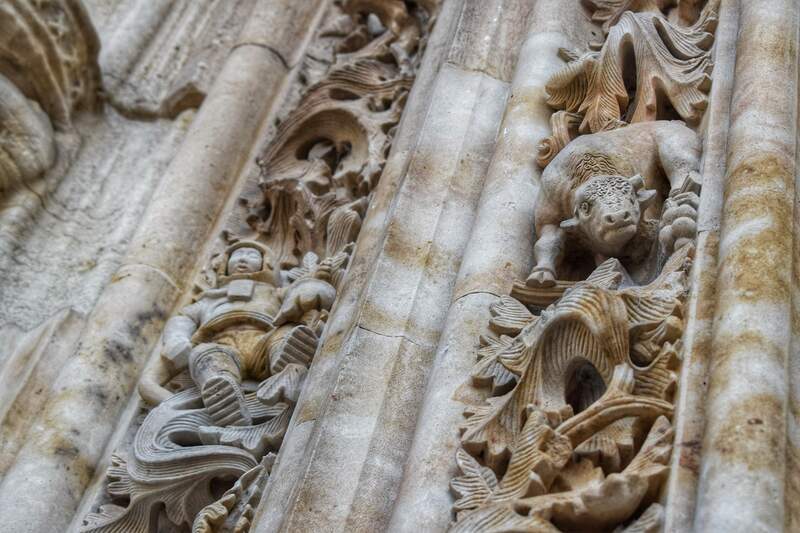 These include an astronaut that has been carved into the side of the New Cathedral’s facade. It was added to the relief work when the building was renovated in 1992, along with several other whimsical depictions, such as an ice cream. 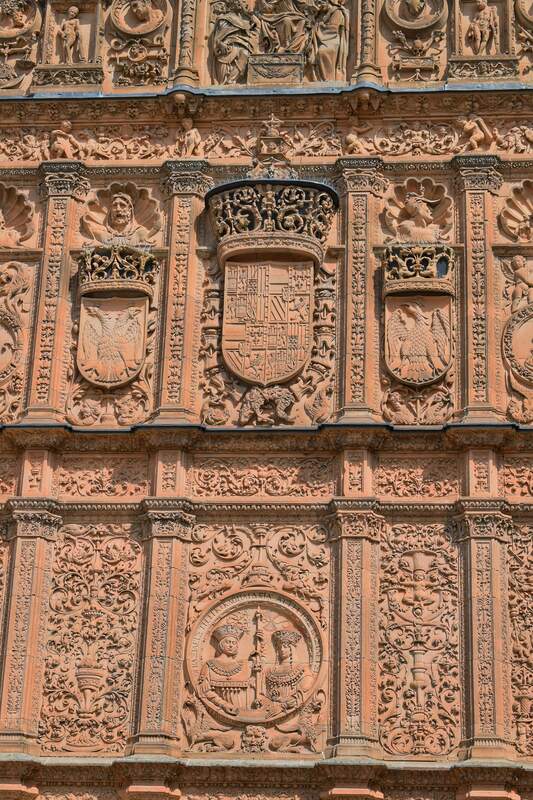 Over at the university’s main building, there is another curious carving, but it is so hidden among the detailed relief work on the Puerta de Salamanca that something of a game has come about spotting it. That’s right, somewhere amongst the depictions of King Ferdinand, Queen Isabella, the shields and the skulls is a small frog. 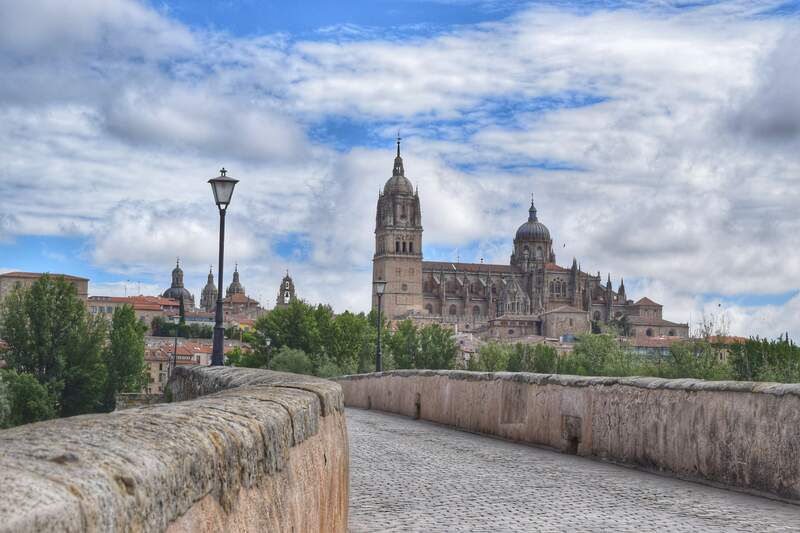 Spotting it unaided is said to lead to good exam results – Salamanca is a university town after all – or for you to be lucky in love. As I stood looking up at the imposing facade, trying to catch a glimpse of the stone amphibian, I could hear ribbiting in my ears. After a while, I realised it wasn’t my imagination playing tricks on me, but a lady selling frog keyrings, complete with sound effects. After finally catching a glimpse of the creature, I purchased a keepsake and was on my way. I’ve been to Spain a number of times and done some interesting tours around the country, but none have ever included Salamanca. Damn do I feel like I missed out! Well, I don’t think it’s going anywhere, Nina, so you’ll have to include it on your next Spanish itinerary. Spain has so many wonderful destinations I bet you’ve seen some beautiful places. Art Deco, sky murals, historical architecture and frogs (?!) Sounds like my kind of city, especially without crowds. That sums it up Elaine. I’m sure you’d love it; I certainly did.